When four boys are ‘bought’ from orphanages around Carthya by a mysterious nobleman named Connor they find themselves in a different world - one of wealth and privilege. But it does not take them long to discover the purpose they have been taken for - the only thing they have in common is their physical appearance and Connor wants one of them to impersonate a long lost prince. And the boys soon realise that when one of them is chosen, the rest will be left in possession of a secret so dangerous and traitorous that they will not be allowed to live. This is a totally absorbing and gripping story, told in the first person by Sage, an entertaining and wonderfully unreliable narrator. The author writes skilfully, letting the reader get emotionally close to the characters, leading reader perceptions and employing a sleight of hand which conceals plenty but doesn’t leave the reader feeling cheated as all is slowly revealed. Although a fantasy, the magic is in the writing, not the storyline which is firmly based in an alternative medieval reality. Danger, sword fights, secret passages, conspiracies and deceit abound in this dark and thrilling adventure. Being Book 1 of The Ascendance Trilogy, there are more adventures to come. I was happy to discover this as I didn’t want to leave the characters just yet, and I found myself thinking about the book long after I closed its pages. 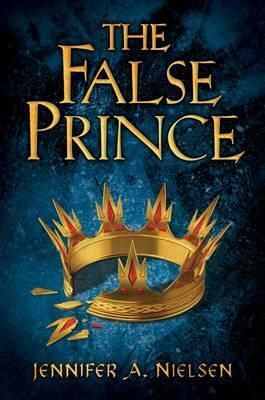 The False Prince won the 2012 Cybils Award in the Fantasy & Science Fiction category. I would highly recommend this to readers of fantasy, adventure, the knights and chivalry era, and those who love mystery and intrigue. It should appeal to readers from 10 years and up.